Graeber writes “For ‘small a’ anarchists such as myself—that is, the sort willing to work in broad coalitions as long as they work on horizontal principals—this is what we’d always dreamed of.” Of course, to limit coalitions to partners who work on “horizontal principals” guarantees that they will not be very “broad” at all. Graeber doesn’t reflect on the fact that much of the emotional energy inherent in the liberal/anarchist divide boils down to tribalism and the narcissism of small differences. For various cultural and generational reasons, many people in these groups just don’t like one another very much, but they have more in common than many in either camp would like to admit. And they both have much they could teach each other, if they would listen. For example, progressives are often smug and insular in a way that excludes exactly the kinds of activists who injected so much energy and fresh thinking into Occupy Wall Street encampments all over the world. At least briefly, OWS had a culture of inclusiveness that empowered thousands of people who had no previous way to plug into established progressive organizations, other than passively making financial donations or signing internet petitions. On the other hand, the massive publicity about OWS exacerbated a kind of anarchist exceptionalism. Graeber grandly proclaims that OWS represented the “first time since the civil rights movement in the 1950s, a success for Gandhian tactics in America.” This would certainly come as a surprise to anti-war activists like the Berrigans and anti-nuclear power activists like Sam Lovejoy, as well as many others. And of course, there is no “accomplishment” to date that OWS can point to that is remotely equivalent to those of the civil rights movement. Graeber writes as if he believes that anarchists—and anarchists alone—had unlocked the door to democratic transformation and that all progressive efforts were permanently obsolete. But that is a delusion. Anarchists, like liberals, do some things that work and some that don’t; they both win some and lose some. Many liberals were equally unfair in their assessment of OWS. There were hand-wringing pieces about the risk of radicals sabotaging President Obama’s re-election and comparing the protests to a cartoon version of the anti-war movement of the ’60s. In fact, despite a profound disappointment with many of the Obama administration’s policies, there was no disruption of the Democratic convention, nor any incidents that gave fodder to the right wing. Meanwhile the “1 Percent” meme clearly damaged Mitt Romney. There was also overblown progressive anxiety about a supposed tendency toward violence in what was clearly a nonviolent movement. The anarchists support for a “diversity of tactics” allegedly gave those who engaged in “black block” tactics license to disrupt nonviolent demonstrations. Chris Hedges wrote a widely read essay referring to this alleged violence as a “cancer” that could destroy the occupy movement. But Graeber persuasively points out that the actual practices of the movement should mitigate such concerns. “There are always boundaries, acknowledged or otherwise…. Just as ‘diversity of tactics’ is based on the tacit assumption that no one would ever show up at a demo with a car bomb or rocket propelled grenade, so assertions that no activist should be expelled from a meeting do assume certain parameters.” With very few anomalous exceptions, the occupations were free of violence except for the unconscionably rough treatment some cops gave to nonviolent protesters. For many who were attracted by slogans like “banks got bailed out, we got sold out,” the fetishization of process seemed like bait and switch. Horizontal decision making at general assemblies and small groups could go on for hours. Far from being democratic, the time-consuming process discriminated against people with jobs, those who had to take care of children or sick people, those with health problems of their own and those unfamiliar with anarchist culture and jargon, among others. Just as is the case with liberal structures, horizontalism encourages democracy in some contexts and dampens it in others. Then there is the “no leaders” concept, which is not without its virtues. Without designated leaders, there are no individuals who can be targeted for arrest, smear campaigns or even assassination. The lack of leaders also forestalls the creation of overnight movement celebrities who, corrupted by publicity and power, may develop agendas at odds with the people they are supposed to represent. But an absence of leaders also causes an opacity that is confusing and needlessly off-putting to those outside of the in-group. If no one has any authority, then no one has any responsibility. As Jo Freeman’s feminist essay “The Tyranny of Structurelessness” pointed out long ago, a lack of structure can disguise cliques or individuals who have de facto control without any accountability. Graeber anticipates these critiques, and he describes various ways to ameliorate the flaws and excesses of consensus decision-making for larger social groups such as “lottery systems…something vaguely like jury duty except non-compulsory, with some way of screening obsessives, cranks, and hollow earthers, but nonetheless allowing an equal chance of participation in great decisions to all who actually do wish to participate.” That sounds nice, but it’s far easier said than done. Graeber declares “it’s hard to imagine” that the abuses of such a system “could actually be worse than the mode of selection we use now.” One would think that anyone who’d studied even a little history would have little trouble imagining societies much worse. And Graeber doesn’t address the many areas of organized life in which expertise is indispensable. 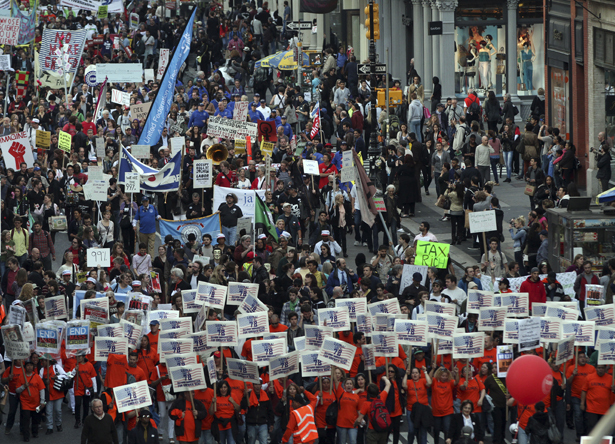 A series of public events in New York—including on Veterans Day 2011, Martin Luther King Day 2012 and a much-hyped May Day 2012—squandered the enormous hopes that had been raised for a new vision and made depressingly minor impact in large part because unwieldy committees bound by horizontal process made decisions that failed to inspire anyone other than those who felt therapeutic reward from the process. It was the closest thing to an issue specific demand that OWS produced and could have been a big deal if the movement had decided to work on a mutually respectful basis with reformist wonks advocating for a constitutional amendment to overturn Citizens United. Yet Graber doesn’t even mention it. Only a small fragment of OWS participated in “money out” groups, and most anarchists chose not to focus on the issue, which was apparently deemed too reformist by the cognoscenti. Graeber is absolutely correct in his outrage at the state’s overreaction to OWS, including evicting encampments that posed no threat to public safety and the arrests and beatings of nonviolent protesters. This repression represented a real erosion of American democracy and the policies that produced it should not be allowed to stand. But in his most unfair anti-liberal inference, Graeber claims, “It’s also fairly clear that when the camps were cleared…the liberal establishment more generally made a strategic decision to look the other way. From the perspective of the radicals, this was the ultimate betrayal.” This is toxic and untrue accusation. It may be that many in OWS themselves made such a decision. Following the evictions, rather than focus on the right to protest, many occupiers concentrated on upcoming rallies like Martin Luther King’s birthday (J15 in OWS parlance) and May Day, with its ill-conceived call for a “general strike,” and on campaigns like debt abolition and preventing home foreclosures. Meanwhile, several non-anarchist civil liberties lawyers worked tirelessly to represent those who were arrested and who had possessions destroyed by the police. In April, Norman Siegel, the former executive director of the NYCLU, won a settlement for OWS against New York City for over $300,000 for property destruction of occupiers during the eviction. Despite his anarchist provincialism, Graeber’s central thesis is very strong. With all respect to the Democratic party of Clinton and Obama for keeping the hounds of fascism at bay, far too often it seems like their message to America is, “This is as good as it gets, folks.” For progressives, as well as anarchists, this is simply not acceptable. Graeber is no worse than most liberal thought leaders when it comes to insularity and hubris. He is right when he says that the liberal world in the early Obama years suffered from a “chilling” of the imagination and his very willingness to express ideas outside of the conventional progressive sphere, which he does repeatedly and engagingly in The Democracy Project will add important intellectual energy to both the anarchist and non-anarchists for years to come. Like OWS itself, Graeber is flawed and human and sometimes maddening, and like OWS he is also an important prophetic voice that the left ignores at its peril.